Duncan Lou Who is a pup born with two deformed hind legs that had to be removed. While the boxer has a wheelchair to help him get around, he much prefers the au naturel look. So his caregivers at Panda Paws Rescue in Vancouver, Wash., happily obliged, letting Duncan go wild at the beach, where he hobbled along on his front two legs. But having two legs definitely doesn't slow Duncan down. "There is some slow motion in this video, but NONE of the video has been sped up," according to a description of the YouTube video, above. In other words, Duncan really runs that fast. Now this is what happiness looks like. 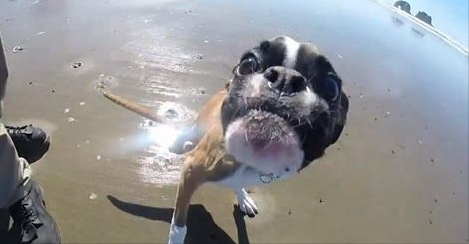 Responses to "Two-Legged Dog Has Best Day of His Life at the Beach (Video)"
How sweet . A great big hug to the wonderful people in his life . They are as fortunate , as he is , that they're family . I pray they all live long happy lives . What an amazing animal and same for this dogs owners. Keep up the good work. It is the QUALITY of life that counts, and this sweet dog has an AMAZING quality life! It brought tears to my eyes, seeing a very handicapped dog, having a time of his LIFE!